A Better Next is a sensitive drama that follows the day-by-day challenges of starting over. 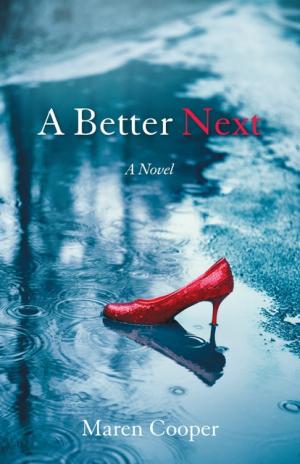 Maren Cooper’s dramatic novel A Better Next follows a resilient woman through her divorce and career as she learns to live on her own. Jess’s typical life gets turned upside down when her children leave for college and her husband blindsides her with a divorce. Throwing herself into her career, Jess uncovers a possible plot for fraud in her workplace. Supported by her two unwavering best friends, Jess even dips her toe back into the dating pool as she comes to terms with the next phase of her life. Jess is a relatable main character who is dedicated to her family. She works diligently in the beginning to save her marriage, even proving willing to put her career on the line for it. Still, she is shown to be well respected at her job; her medical knowledge comes through practical details and the ways she handles real-life challenges. Her evolution is distinguished by psychological milestones, like letting go of anger, refocusing on her career, and dating after her divorce is finalized. Conversely, Jess’s husband, Arthur, is painted as cold and distant. This reinforces his role as an emotionally unavailable partner and increases empathy for Jess and her children. While the tension and anger between Jess and Arthur and Jess’s sorrow and grief over losing her marriage feel authentic, Arthur fades into the background and his story line is unresolved. Jess’s best friends, Diane and Claire, and her new love interest, Jim, make up the bulk of the supporting characters. Diane and Claire are difficult to tell apart; they have similar mannerisms and few distinct personal touches. Through their conversations and situational plot twists, the best friends help to explore themes of loyalty and workplace sexism as they navigate marriage and motherhood. Diane and Claire’s subplots are less realistic than Jess’s, particularly Claire’s unexpected but problem-free pregnancy. Jim and Jess’s relationship is light on chemistry. They never feel truly emotionally connected, and Jess’s important new relationship becomes somewhat of a letdown. The focus on Jim tapers off toward the end of the book, too. Most of the writing is direct, but it focuses more on the senses when describing locations and experiences like the warm aromas of comfort food or memories of noisy family mornings. The story is pulled in many directions, all with Jess at their center, and becomes difficult to follow. Jess’s career becomes the focus midway through, and though the work scandal adds some suspense, Jess’s relationships are left hanging and elements of her past are introduced without ever fully tying in.